As teachers we work towards our learners thinking through issues and forming morally just, ethically balanced views garnered from diverse perspectives. We teach from the local aspect to the global view appropriate to the development of the learner. I share this action-from a group of ladies who will not be silenced, who along with their shared passion of a grass roots craft (pardon the pun) are not afraid to voice their concern for the planet and the welfare of the grandchildren. IKNAG’s Annie Malow contacted Plibersek with two questions asking for “yes” or “no” answers. 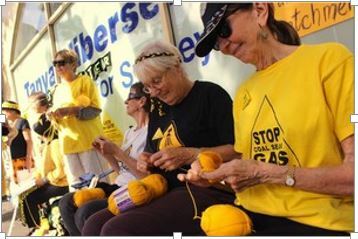 The Knitting Nannas annoy all politicians equally. The publishing of these views do not necessarily support any political party or alliance.